Last year, my editor suggested I take a walk on the wild side and do a K-9 series. What a fab idea! I thought. But I wanted to do something a little different from what already graced the pages of so many outstanding romantic suspense stories. With over twenty years in federal law enforcement, the first thing I decided was to make this a federal K-9 series, highlighting heroes working for one of the many federal agencies and task forces I’ve interacted with over the years. Don’t know what I was thinking, but for my first installment I chose the CIA. I’ve never officially interacted with that agency, and squeezing any information out of them turned out to be more of a challenge than expected. I think my inquiries to the CIA’s Media Relations office were flushed directly into a black hole that never sees the light of day. Did I give up? Never! Plus, I have an active imagination, and I possess what every writer does—a magic pen. Or in today’s world, magic fingers. I dug deep into my fertile imagination, peppered in some real life job experience tidbits, then said a Hail Mary and started tapping away at the keyboard. The next thing on my list was to come up with main characters that weren’t cookie cutter copies of anything I’d previously written. Piece ’a cake, right? Not so much. To create Trista and Matt, I wracked my brain so hard it hurt. The end result—I absolutely LOVE these characters. Trista Gold is the CIA’s crack intelligence specialist, analyzing Top Secret code and making recommendations on national security. She’s a total brainiac, and when it comes to her job she’s aces, the best of the best. But when forced to interact with actual human beings—especially men—she’s completely inept. Talking to computers is her specialty, not conversing with Homo sapiens. Trista long ago figured out it was easier to blend into the background where no one would see her or bother her. Hence the drab gray, head to toe trademark clothes she wears that she only thinks make her invisible. CIA officer Sgt. Matt Connors is Trista’s total opposite. He’s confident and totally secure in who he is as a man and a federal officer. When Matt looks at Trista he sees a stunning, sensual beauty itching to escape the confines of her boring outward appearance and uptight demeanor. Matt opens Trista’s eyes and helps her to understand what others, including Matt’s friends do: she’s an utterly amazing woman any man would kill to be with. What Matt doesn’t initially perceive is that he needs Trista more than he realizes. He’s been in emotional pain for twenty years, yet he still can’t bring himself to seek out professional help. Trista is the trigger that pushes him to face a frightening reality—if he doesn’t take that scary step, he’ll lose her forever. Matt is, quite possibly, my most tortured hero yet. And I mean this in a good way. My guys are alpha to the core, with gorgeous muscle-bound physiques, but when you create such physical perfection there’s gotta be a flaw or, at a minimum, some level of emotional scarring. As a reader myself, I think this makes heroes more intriguing, and makes me fall in love with them and root for them even more. With that in mind, I needed to pen something unique for Matt’s backstory, and I think I’ve done that. Sorry, no spoilers here, only teasers. Despite having such a tortured past with enough angst to sink a ship, Matt is one of the most heroic and hunky men I’ve ever created. Trust me, ladies, if a guy like him truly existed, I’d fall head over heels in love. Last but hardly least, is Sheba the K-9. Sheba is a beautiful, intelligent, and intense Belgian Malinois. Sheba is the “other woman” in Matt’s life. Sheba and Trista get off to a rocky start, but even their tentative relationship changes and blossoms throughout the story. Now I don’t want you to think this book is all romance, so grab onto your seats. This tale is set against a backdrop of espionage, international intrigue, and murder. Trista is one lucky girl. 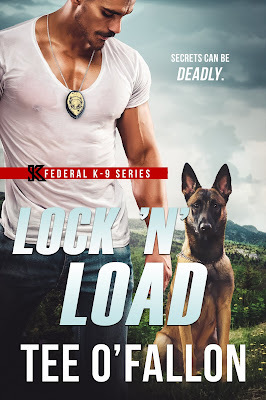 Not only does she have the hunkiest of men protecting her when her life is threatened, but she also has Sheba. Sheba is just as much a part of the story as Trista and Matt are, and I hope you’ll love her as much as I do. She certainly looks great on the cover! She squeezed her eyes shut, willing the unbearable pain to stop. It didn’t. With every breath, her ribs screamed in agony, to the point where she nearly blacked out. The muscles in her abdomen spasmed from the fresh blows, never having completely healed from the last beating. Her left eye throbbed and was so swollen, she could barely see out of it. Gritting her teeth, she pressed her palms on the cheap linoleum kitchen floor, trying to push up on her hands, but there was no traction and she fell back down with a painful thud. It was impossible, she now realized. In her weakened state—and with the floor so covered in blood—her hands kept slipping. “Mama!” her little boy cried. “Stay there!” She held up her hand, gasping as another shaft of pain speared her entire upper body. Her son’s pale cheeks were streaked with tears, as were hers. Although she didn’t know whether his were from seeing her like this or the terror of what was before them. Lying in the ever-widening pool of blood surrounding her was her husband’s deer-gutting butcher knife. And her dead husband. The flow of thick, sticky blood that had poured from the gaping wound in his belly and the deep slice in his neck had gradually slowed to a trickle. From the amount of blood, she’d guess the knife had sliced into an artery somewhere. “We have to get out of here, Billy,” she whispered on a strained exhale. She took another agonizing breath, this one shallower, so it didn’t hurt so much. “Walk around the blood and help me. Careful not to step in it.” She didn’t want to leave any sign that her son had been there, including any bloody sneaker prints. Billy stared at her, his watery blue eyes wide, his hands trembling. Still, he didn’t move, and the realization had her worrying that he’d be mentally scarred for life. “Billy, sweetie. I need your help. Can you come over here and help Mama?” Painful though she knew it would be, she raised her arm, wincing as her ribs screamed in protest. Surely several of them were cracked. “Come quickly. Please,” she added when he didn’t budge. “O-okay.” His chest rose and fell, and to her relief, he began skirting around the blood, keeping his back to the kitchen counter. She grabbed the bloody knife from the floor and began wiping it clean on her shirt. Even though her husband had a lengthy record, the police would still process this as a crime scene and look for the killer. Tee enjoys hearing from readers and can be contacted via her website http://teeofallon.com where you can also Sign up for Tee's newsletters and contests! Hi Sue, I hope you'll check out Lock 'N' Load. I really enjoyed writing this one!! Sorry, Sue, I didn't intend to be "unknown"! This has what I like in a story: wounded hero, a K-9 as either a partner or a pet, and a shy, reserved heroine. I will enjoy this one..
Patricia, I hope you enjoy my story! This sounds fantastic! I must buy it! I hope it lives up to your expectations, Lisa! Thanks, Lynn! I'm hard at work polishing the sequel! !